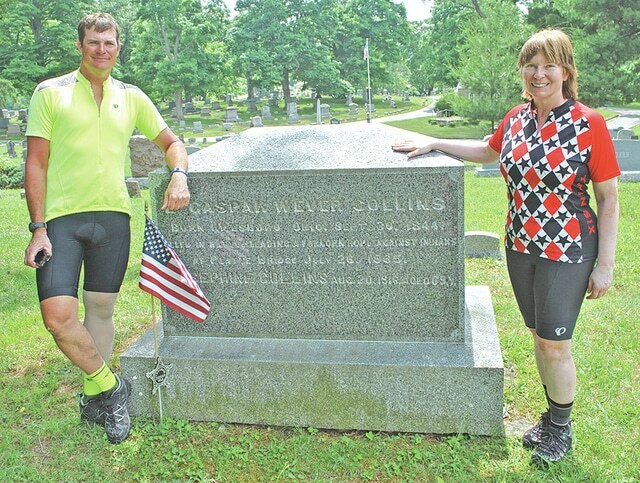 Brian and Dena Squire are pictured next to a stone in the Hillsboro Cemetery marking the resting place of William and his son Caspar Collins. Two cities with a link from long ago were reconnected Friday when Brian and Dena Squire arrived in Hillsboro on a tandem bicycle. An avid bicyclist who rode his bike to work in his hometown of Cleveland nearly every day for 32 years, Brian always had a notion to make a bicycle trip around the country. It was after the Squires moved to Fort Collins, Colo. two years ago that Brian noticed his route would take him past a city of interest named Hillsboro, Ohio. “I was trying to immerse myself into my new city and started researching its history,” Brian said. “I saw that the man who the town was named for was from Ohio and that intrigued me. On Friday, Brian and Dena delivered a letter from former Fort Collins Mayor Karen Weitkunat to the city of Hillsboro. Weitkunat’s term as mayor expired in April after the Squires departed March 28 on their 5,300-plus mile journey. Weitkunat’s letter, addressed to Hillsboro Mayor Drew Hastings, reads: “Upon conducting research into our local history archives, we wanted to celebrate the common connection that our two communities share regarding Col. William O. Collins. Col. Collins came to Hillsboro in 1832 and was a resident of the city for 48 years. He was recognized as a ‘lawyer of ability’ and was prosecuting attorney for the county from 1837-1840. In December 1861, he enlisted in the U.S. military and was commissioned colonel of the 11th Ohio Volunteer Cavalry. His regiment was stationed in the Rocky Mountains until 1865, when he returned to Hillsboro and was appointed collector of Internal Revenue by President (Andrew) Johnson. He was well-loved in Hillsboro until his death in 1880. “As you can tell by the name of our city, Fort Collins’ history is intricately tied to Col. Collins. Following the well-known flood of June 1864, Col. Collins at Fort Laramie received a report that detailed the damages to Camp Collins (originally located in present-day town of Laporte) and suggested a new site that would be safe from the raging waters of the Poudre River. “After receiving the report, Col. Collins and his guard left Fort Loramie for Laporte, arriving on Aug. 13, 1864. Colonel Collins inspected the flood damage and surveyed the proposed site, which was suggested by Joseph Mason. “Colonel Collins approved of the new area and on Aug. 20, 1864, passed Special Order Number One, which officially designated the area a military reservation. While Abraham Lincoln did not officially approve of the designation until Nov. 14, that August day when the colonel visited ‘his’ camp and approved of its relocation to higher ground is the day remembered as the city’s birth. “Fort Collins’ history is intricately linked to HIllsboro’s famous 1800s resident, Colonel William O. Collins. “Welcoming Brian and Dena Squire as they bicycle into town … will reconnect the historical bond of our municipalities. William O. Collins was the father of Hillsboro native Caspar Collins (1844-1865) who went west with his father in 1861 at the age of 17. He was killed in 1865 in Wyoming when he and the 25 other men he was leading to rescue a supply train was ambushed by thousands of Indians in what is known as the Battle of Platte Bridge. Casper, Wyo., Fort Caspar and a mountain and river are named after him. In 1866, his body was brought back to Ohio with the Ohio 11th Calvary and he is buried in the Hillsboro Cemetery. Today, Hillsboro residents Buddy and Marilyn Pence live in the house on Collins Avenue where Caspar was born while it was being built. On Friday, the Squires visited that house, the burial site of both William and Caspar Collins in the Hillsboro Cemetery, and other local historic sites. On July 24-26 of this year the Fort Caspar Museum near Caspar, Wyo. will host the Platte Bridge 150th/Caspar Collins Days in recognition of the fort’s namesake and the Battle of Platte Bridge. Several members of the Highland County Historical Society in Hillsboro are planning to attend. Caspar, Wyo. resident Randy Bjorklund recently notified the city of Hillsboro that Caspar area residents are also in the process of trying to have the Congressional Medal of Honor awarded to Caspar Collins. Meanwhile, the Squires said Friday’s stop in Hillsboro marked the 2,650-mile mark, or halfway point, in their journey. They traveled from Fort Collins, Colo. to Austin, Texas, where they spent a week with a daughter, and had a surprise visit from other family members. They travel 40 to 50 miles almost every day, pulling an 80-pound trailer, but have had to stop a few days due to weather. They plan to be home on Aug. 30.